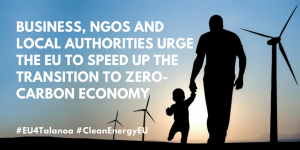 (12 June 2018) – A Coalition for Higher Ambition comprising a unique gathering of businesses, investor groups, local and regional authorities, and civil society groups including ECOLISE, today called upon EU leaders to accelerate the transition to a zero-carbon Europe and thus limit climate impacts and allow for improvements to public health, greater competitiveness for businesses, and an increase in good quality jobs. The statement comes prior to the High-Level EU Talanoa Dialogue where key decision makers and stakeholders will be discussing ways to step up climate action; and the final round of negotiations on the EU’s energy legislation for 2030, both taking place on 13 June. ECOLISE’s policy coordinator Meera Ghani is representing ECOLISE at the Talanoa Dialogue event.